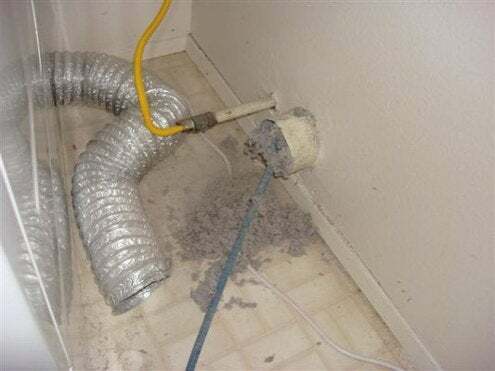 Here’s a job you can do in the cool basement to beat the summer heat, and you should add it to your twice a year to-do list: clean the dryer vent. Poor dryer venting and maintenance causes more than a hundred million dollars each year in damage. Clogged vents don’t just cause fires. They also reduce the efficiency of your dryer to the point where you could be paying an extra $20 a month to run it and it won’t be long before you’ll have a costly repair on your hands. If clothes are taking longer than normal to dry or are still hot and damp after a full cycle, that’s a clear signal that you need to clean the vent. You can hire a pro to do the job or, for fifteen to thirty dollars, buy a dryer vent cleaning kit with a rotary brush that extends up to 12 feet. Some kits are made to rotate with the help of a power drill. Make sure you extend the brush the full length of the vent so no hidden blockages remain. Then use the vacuum extension to remove the lint and debris the brush has loosened. Check connections and if it’s time to replace your dryer duct, use rigid or flexible metal ducting (never plastic or thin foil) and metal foil tape to keep your dryer safe.